The past week was surprisingly busy even as the outdoor track season slowly winds down. We have meets to recap, potential match-ups to preview and doping news. But let’s start on Friday–the day the music, at least the music being played during marathons, died for some elite runners in the United States. Anyone who has paid attention to, or participated in, a Rock ‘n Roll event, knows how true that statement rings. For many years, the elites at the front of road races in the United States have been subsidized (although not handsomely) by the participatory boom in marathons and half-marathons. This takes nothing away from the accomplishments of those athletes who are trying to make their living competing in the sport, but it highlights a truth that CGI faced. 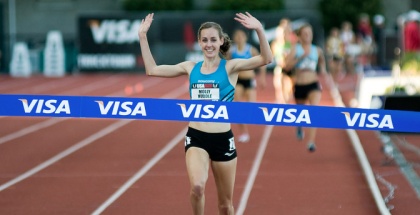 Supporting elite runners doesn’t increase their registration numbers or their ability to attract sponsors. If it did help their bottom line, it is a reasonable assumption that they would have kept the elite athlete program in place. The reality is in the jumbled world of road racing, the elites need the crowds much more than than the crowd needs them. Or at least most of them. CGI will reportedly still keep their relationship with Meb Keflezighi, Ryan Hall, Kara Goucher and Deena Kastor. Not coincidentally these are some of the only names in American road racing that Joe or Jane 5k would have even a remote chance of identifying. So perhaps CGI does seem some value in having them appear at races, speak at the expo and then cruise to a victory. Not such value exists for the next tier of American athletes or foreign runners whose names don’t register at all. From this perspective, the CGI decision was the logical outcome for an event managed by a company whose main priority is increasing revenue. Growing the sport, making the United States more competitive at distance running or other altruistic motives were not part of the equation. As a runner, the high entry fees, big crowds and possible dysentery were enough to keep me away from Rock ‘n Roll events. I never saw the need to have a band banging out the hits performing at mile 9. But I understand that I’m not the target audience and others do enjoy the attempts to liven up a traditionally mundane endeavor. This is the group that Dickey is speaking of when he mentions “lifestyle” and these are the constituents he has to please. These constituents won’t be moved by calls for a boycott. Certainly not on a issue so far removed from their own racing experience. If there is push back against CGI it won’t be because the Virginia Beach Half Marathon is missing a big name or a 2:18 marathoner didn’t have his travel comped. It will be because there was a mishap with the finisher medals, a water station was disorganized or cities decide that the economics of underwriting these races is no longer a viable option. The doomsday scenario for running fans is that this trend will trickle up and impact larger marathons. Despite the news of the weekend, it is hard to imagine the big players in American road racing turning their back on the professionals. Boston, New York, Chicago and the other major marathons will survive because they are able to function as both a race for the elites and the masses. They command worldwide interest largely because of the quality of the professional field. That interest is paramount to attracting title sponsors who enjoy seeing their logo on televisions, newspapers and computer screens across the world. Rock ‘N Roll events never reached that level. Instead, they were firmly stuck in the middle of the road racing world and in business the middle often isn’t good enough. -Tirunesh Dibaba found the one woman she can’t run away from, Meseret Defar. The 5,000 played more to the strengths of Defar who just won the gold medal in that event, but Dibaba made her work for it before losing contact in the final 100 meters. Why didn’t we get to see them race at the World Championships again? -It was another ho-hum victory for Usain Bolt. He recovered from a slow start (at what point do we just start referring to it as his regular start) to win in 9.90. Nesta Carter and Justin Gatlin were close behind in 9.94 and 9.96. Barring a sub 9.76 in Brussels, this will be Bolt’s slowest season in the 100 since 2010 and his slowest in the 200 since 2007. It will be interesting to see how he treats the non-championship year in 2014. No titles will be on the line, but at his age he doesn’t have the luxury of throwing away a year, especially if he is injury free. No doubt he will receive a boost if Yohan Blake is healthy, but Bolt’s his window for running fast times doesn’t look as wide as it once did. –LaShawn Merritt defeated Kirani James again, this time with James running at what appeared to be 100%. Merritt now leads the season series 3-2 with wins in their last two meetings. -She probably will be overshadowed by the massive win streak of Valerie Adams and the three gold medals by Shelly-Ann Fraser-Pryce, but Zuzana Hejnova deserves serious consideration for the female athlete of the year. Her perfect season continued on Thursday in the 400-meter hurdles where she won easily in 53.32. Hejnova now owns eight of the 10 fastest marks of the year and her margins of victory have been consistently comfortable. In a year without Adams or Fraser-Pryce she would be an easy call. –Full results from Zurich including more strong performances by David Oliver, Nick Symmonds and Eunice Sum. -In Berlin, Valerie Adams and Mohammed Aman won easily, Ezekiel Kemboi dropped out and Maria Abakumova threw the javelin farther than any woman has in the last two years. -At the Decanation meet in France the United States captured the team title and Italy finished last and now looks poised for relegation. –Dwain Chambers could face disciplinary action after he reportedly punched a wall in Moscow following Great Britain’s disqualification in the 4 x 100 relay. After five straight relay DQs in major championships for Chambers, the wall probably got off easy. Contrast the image of him punching through a wall, with this picture taken before he heard his team had passed out of the zone. *Michael Johnson vs. Maurice Green in the 2000 Olympic Trials. *Michael Johnson vs. Donovan Bailey in the 150-meter match race. –Matt Tegenkamp won the US 20k championship in New Haven, Connecticut on Sunday. The 31-year-old will make his marathon debut at the Chicago Marathon in October. Could he be the next American to break 2:10? –Tirunesh Dibaba rebounded from her loss to Meseret Defar and almost set the 10k road record in Tilburg, Netherlands on Sunday. Dibaba finished in 30.:30 narrowly missing Paula Radcliffe’s record of 30:21 from 2003. -It is hard to believe, but NCAA cross country has already kicked off. Jesse Squire takes a look at what was at stake in week one (not much) and shows how football and cross country can peacefully coexist. 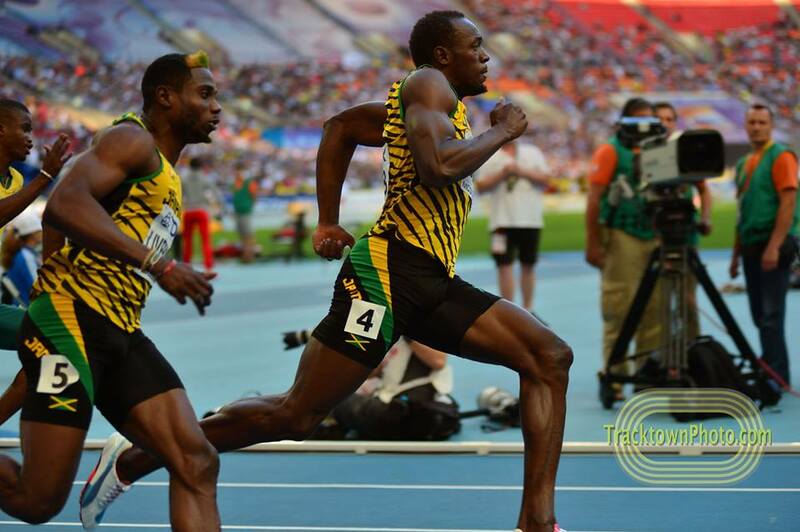 Not good news for the Jamaican Anti-Doping Commission which is already facing suspicions that they are ill-equipped to manage the anti-doping protocols of the world’s fastest nation. -David Oliver, Justin Gatlin and Sandra Perkovic are all scheduled to competed Tuesday in Zagreb. Also, Caster Semenya will run in her second major competition of the year in the 800 (she ran 2:01.83 in Zurich). -On Friday, the Diamond League season concludes in Brussels and features Usain Bolt, Mohammed Aman, Sally Pearson and Shelly-Ann Fraser-Pryce. Still waiting on that first world record of 2013. Also, 400-meter hurdler Felix Sanchez will be looking to bounce back from last week’s defeat at the hands of a hurdling cyclist.